Lesson on skiing and other winter sports. With photos. Can be read in class and discussed. The above downloadable printable is a great resource for high school students and elementary school students at Elementary (A1), Pre-intermediate (A2), Intermediate (B1) and Upper-intermediate (B2) level. It is a useful material for teaching Parts of Speech (aka word classes, e.g. nouns, verbs, adjectives, adverbs) in English, and is a valuable material for improving your students' Listening, Speaking and Reading skills. 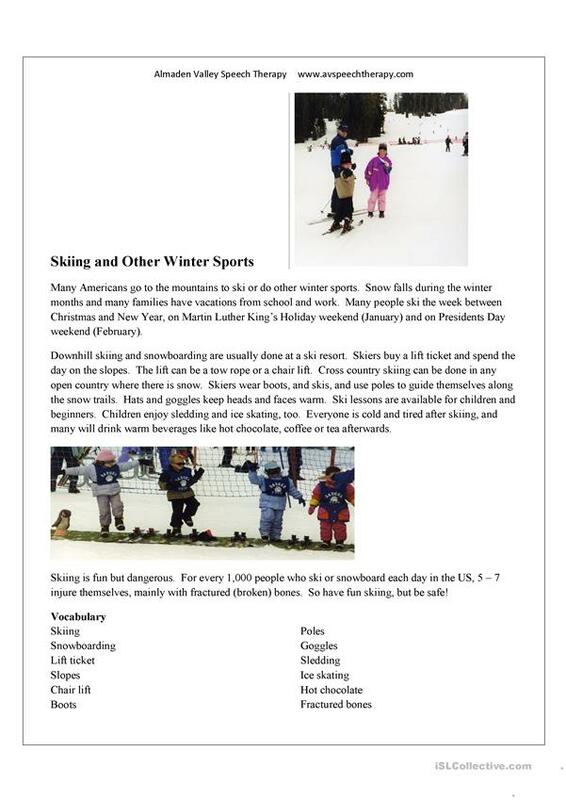 It is focused on the vocabulary topic of Winter. I'm a licensed and certified speech-language pathologist teaching American English pronunciation to new immigrants in the San Francisco Bay area, California, USA. My approach is more inclusive than traditional phonics. I teach all the sounds of English, word-linking, reductions, stress and melody. See all my free worksheets at my blog www.avspeechtherapy.com.